Things are rapidly hotting up in France. The Gilets Jaunes or Yellow Vests (Yellow Jackets, EIE) movement, which started as a protest of hard-up working people against spiralling petrol prices, has transformed itself into a full-on uprising against the neoliberal regime of President Emmanuel Macron. Originally published by Lundi matin. Translated by Winter Oak. Here we (Winter Oak) offer a slightly-rushed translation of a significant article published earlier today on the lundi.am website, which is close to the Invisible Committee, authors of The Coming Insurrection. The situation is simple: the people want the system to fall. The system intends to keep going. This defines the situation as insurrectional, as the police themselves are now admitting. The people have numbers, courage, joy, intelligence and naivety. The state has the army, the police, the media, cunning and the fears of the bourgeoisie. 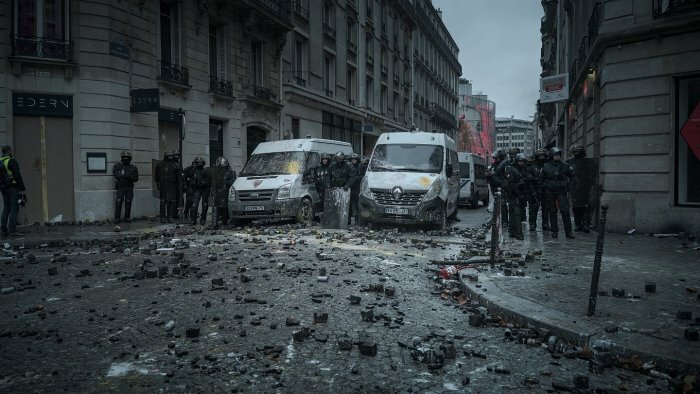 Since November 17, the people have used two complementary levers: blocking the economy and the assault carried out every Saturday against the administrative centre of Paris. These levers are complementary because the economy is the reality of the system, while the government is the symbolic representation. To really bring the system down, both of these must be attacked. This applies to Paris as to the rest of the country: setting fire to a local préfecture and marching on the centre of power are one and the same gesture. If only the British people had the courage of the French working people. When the British riot yhey smash shops and loot goods to ape the bourgeoisie in thier appearences and objects or possessions . When the French people revolt they seek only to re-posess democracy !! #Frankreich am Abgrund: „Entweder stürzen wir das System oder das System wird uns vernichten“ – Enough is Enough! I am not qualified to pass comment on this issue other than to say people should read their history more closely. The French Revolution was far from glorious. In fact it was hijacked and used for bloody reprisals where percieved enemies were slaughtered in their tens of thousands. Anarchy may be a French option but be very careful what you wish for. “ I am not qualified enough-‚ We are all qualified to have an opinion….Your comment is a cop-out…Means yu dont have to get involved or come under the radar of — discontented with abuse by governments … Most people have read or studied the “ French Revolution to some degree…. no need to hide behind history in order to step up…. God help anyone who has to rely on you for support.